On yesterday's post, Modern Robinson Crusoe, left a comment asking what I wanted to be when I grow up. I have been thinking about that the whole night. I am currently good at dismantling various stuffs. Maybe when I grow up I want get something to do which is related to dismantling. Yesterday morning, Mamarazzi left me on my high chair for awhile without anything to play. I managed to grab the Astro Controller and started to fiddle with it. When Mamarazzi came back I give her this "innocent" look. "Look, Mamarazzi. I managed to dismantle the Astro Controller. Now you can wash the dirt that accumulated in the controller liao". Mamarazzi's question is "To serve Roti Panjang or not to serve roti panjang?" Good practice....for 'Kemahiran Hidup' subject when he goes to primary school! LOL! Hi Small Kuching, right,.... looks like you either got a future doctor/surgeon or an Engineer. When my youngest son was 2 years old I got him a leggo set, later a Mechano set....to do what his imagination takes him. Plus screw drivers, spanners etc toys. 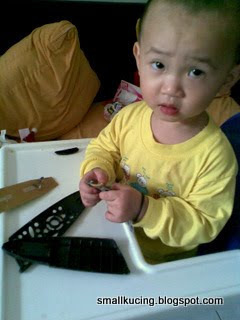 Actually I was doing reverse psychology....I wanted him to grow up to be an Engineer. And yes! He exceeded my and his expectations...he graduated first with a Robotics degree, then an Aerospace Engineering degree. 7 US aeroplane manufacturing companies offered him a job. Today he is working for a well known American plane company as an aerospace Engineer trouble shooter. Yes...study what your kid enjoys doing....watch. observe, then get him the appropriate toy. A friend of mine here gave his daughter a medical kit toy to play with when she was 5. She told her daddy then she wanted to be a nurse when she grows up. 4 years ago she received Canada's highest study award and scholarship, The Queen Elizabeth award for Excellence. She scored all distinctions in her U exams 99.9....she today has 3 more years to becoming a doctor, specializing in Forensics. Lots of parents doing this, giving their kids certain toys to motivate them. Their future. Roti panjang normally served during breakfast only..so don't woli Joshua boy ;-).. Oh!! A born mechanic or technician! hahaha!! No lah, he is going to be a good helper in the house for mummy when he grows up. HAHAHAHHAHAHAHA....look at his innocent look, how you got heart to serve him "roti panjang"? Hubby memang wanna get Mechano set for him. But rather hard to find over here. As for buying toys to inspire him for the future...well...did gave him a laptop and tool set for Xmas. I think he was real "inspired" by the toolset hence the dismantled remote control kakaka. You can say that again. Got extra Astro controller for me? Lucky for us, we have got two astro remote controller, Chris. 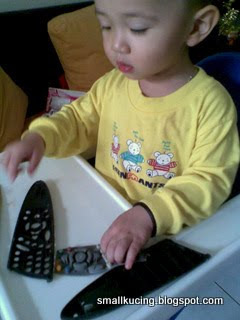 Haiz...my home theater remote controller was destroyed by a kid while she was visiting us. Had yet to get replacement till this date. Eugene...hopefully it's the name that will make the man. But I'll settle for him being happy. Now he very clever jor. Always give "innocent" look.